When we look at the history of angels we cannot be certain where the idea of angels as winged beings originated, but it seems likely that they evolved from the winged deities of Sumerian, Egyptian and Semitic belief. These beings were depicted and sometimes described as "messengers of the gods". The earliest representation of an angelic being has been discovered on a Sumerian stele which is an ancient upright stone slab decorated with figures and inscriptions and which archaeologists believe could date as far back as 4000 BCE. This would date it to 1,000 years after the founding of Sumeria, the world's first civilization. This specific stele shows a winged figure, an inhabitant of the seven heavens, pouring the water of life into a king's cup and could very possibly be where the history of angels start. To be "in seventh heaven"
Today this saying is used to describe exaltation. It therefore seems relatively safe to assume that Sumeria was at least the front, if not the source, from which these other tributes sprang and were sustained. The belief in winged messengers as a celestial species, distinct from the gods themselves was propagated throughout the ancient world with the migration of the Semitic tribes in the 2nd century BCE. In their wake came the itinerant mystics and the self-proclaimed prophets, who adopted regional deities mostly to endorse their apocalyptic pronouncements. When looking at the history of angels it is from the Semitic tradition that we inherited the angels and archangels that are known by name. In the ancient world the celestial messengers of the gods remained anonymous. Yes, there are many different types of Angels. 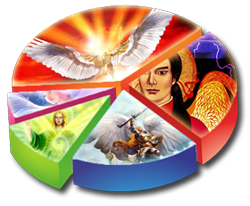 The ones you will most often hear about are the Archangels, Guardian Angels and Earth Angels. All of these Angels have different purposes and some specialize in certain areas but all of them are here to assist you on your soul's mission. The Archangels are amongst my favorites not only do I use them in my healing on myself and others but I present The Way of the Archangels Course wher you can discover how to work with these magnificent being in you life.